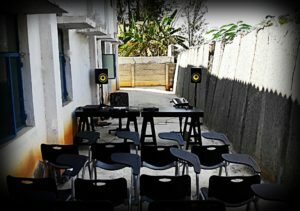 Joe Panikar, an electronic music producer, of the music and visual collaborative Aerate sound; presented a music production workshop at the Audio Academy premises. 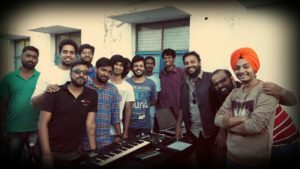 The workshop was conducted as a joint effort by the indie label Bangalore Recording Co. and Audio Academy to educate young budding producers about the process of music production from it’s inception to distribution to an audience. The workshop at the request of production faculty Dawn John Philip was held outdoors instead of a classroom. The unorthodox location instead of a the traditional classroom not only lent a refreshing air of excitement amongst the students, It also became a metaphor for the workshop itself as Joe proceed to dispel the strictly adhered traditions of music making. Melody and harmony are sonic movements in time created and visualized in part or whole. Traditionally, a composer would develop an idea(a melody, or a phrase) into something meaningful and the proceed to dress it up for the occasion at which it is debuted to the audience at large. This approach now seems archaic when considering the tools that are available to us in this day and age. Joe being a live drummer followed this traditional approach until he discovered the editing capabilities of Ableton Live .Through the use of splicing and cutting samples, his workflow to making music is now more relevant to the modern approach of music making. Joe exclaims with humor that most musicians end up with a lot of ideas that go unused in their pursuit of that perfect ‘hummable’ tune. He suggested that we musicians should instead explore the same idea the they we were so quick to write off and find something that they we would like to use even if it’s just a single note. The technology that we musicians use today empowers us to take the best parts of an idea and juxtapose it with something completely different giving it new context. This change of context alone may help the musician achieve what he or she was striving toward. Joe explains that it is a simple process of taking an audio recording and simply chopping it up and moving it around in the timeline. A change in the context of time results and drastically new ideas and a wealth of creative choices. He demonstrated this approach by taking us the audience through one of his own compositions where he’d sampled a blues guitar recording and extracted very specific licks to make up the core sound of his track. He talked about other ways of changing the context of an idea by using spatial effects and pitch transposition, which he adeptly demonstrated in his own track. The students found a sense of relief as they were now thinking of new paradigms for their old and seemingly trite ideas. They proceeded to show Joe some of their work and seek advice on how to better represent the core ideas that made up the track. Joe eagerly pointed out the strengths of all of their tracks and advised them to explore ways to reinforce them as he had in his own work. He insisted that in exploring you wind up with a lot of happy accidents that you may have never even considered. The workshop comes to a fitting close on that.